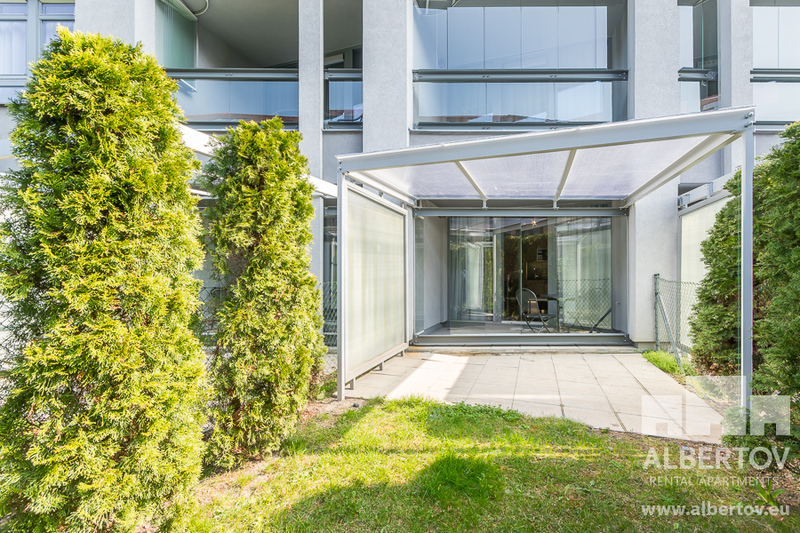 A completely furnished apartment for rent – apartments in Prague in Albertov Rental Apartments. Luxurious, duplex apartment with a spacious, partially covered garden is designed with heated wooden floors, comfortable pull out seating set which can be used by your guests. For your entertainment a satellite television was added with a fast wi-fi connection. The fully equipped kitchen with modern appliances is connected with the living room although the bar separates them. 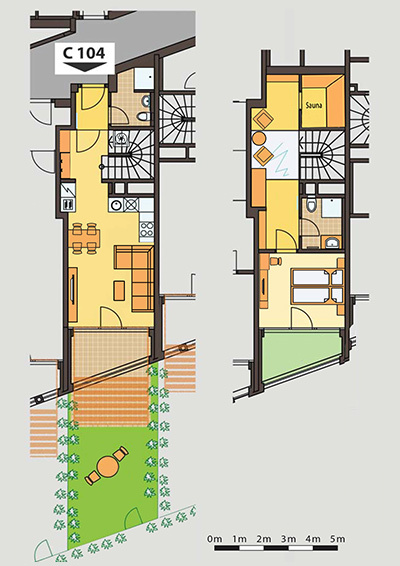 Two bathrooms are a convenience in this apartment, one on each floor. The roomy bathrooms are designed with toilets, showers, sink with LED lighting, floor heating is another convenient addition into the bathrooms. You will discover a king sized bed in the bedroom, that has an anatomical mattress. So on, in the bedroom you will favorite the black out blinds for better sleep. Finish Sauna is on the first floor,adds a good amount of comfort into the apartment.The bar with a wine fridge (cooler) is a pleasant addition. The apartment is located in the closed residence complex in Albertov Rental Apartments, in a calm part of Prague under the Vysehrad Castle, not far away from the center of Prague. If by any chance you are driving we have a garage where you can park. After parking, as you get out of the car you will be able to take the elevator up to your apartment. You also have shopping choices as you step of of the building. Like the pharmacy, (highly chosen by locals) restaurant in the area, Potrefená Husa and a grocery store, Lidl.